Here’s a fact rarely discussed outside of nerdy gaming circles: The guts of your video game console actually matter. Once upon a time games were designed to run the same on every console, and in some cases (like the massive multiplayer first person shooter Destiny 2), games are still designed that way. But most games have what is called a “dynamic resolution” with the resolution shifting on a spectrum from as 720p to 4K depending on the scene. Thus the more powerful the console, the higher and more consistent the resolution of the game you are playing will be. Want something close to consistent 4K without spending a grand on a PC gaming rig? You need a powerful console. That’s where the new Xbox One X comes in. This is the most powerful gaming console ever built, and because of that you will get the closest experience to PC gaming you can get without spending all your time and money on an actual PC rig. 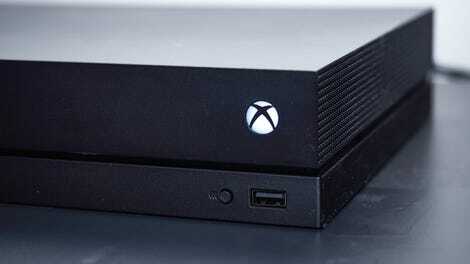 The most powerful Xbox One ever. All your friends have a Playstation. It’s even got a lot of PC games! Thanks to Microsoft’s Xbox Play Anywhere program, there’s a whole slew of great games you can play on your Xbox or your PC. Xbox has also secured some decent console exclusives, like Cuphead, Life is Strange: Before the Storm, and Playerunknown’s Battlegrounds. If you can ignore that fact that all your friends probably have a Playstation and enjoy PS exclusives like Horizon Zero Dawn and Uncharted 4, then the Xbox One X is nearly perfect gaming console. Besides being the most powerful console made to date, it’s smaller than both the Xbox One S and the Playstation 4 Pro. If you play on PC because you want the prettiest possible experience, then the Xbox One X will give you a hassle-free version of that experience most of the time. (PC gaming has an uncapped framerate, while an Xbox One X won’t go above 60fps—which could be a problem if you play fighting games where a single frame is the difference between winning and losing.) If the game you’re playing is “Xbox One X enhanced”—it will say on the box when you buy it—it will play back at up to 4K at 60 frames per second and with HDR. And if the game isn’t Xbox One X enhanced, then the Xbox One X will upscale it very nicely, giving you an experience almost as crisp and vibrant as if it were being played back natively. Somehow despite being the most powerful, it’s also the smallest of the three consoles. Besides delivering nearly as good a picture quality as a high-end gaming PC, the picture also looks a little nicer than what I get out of my Playstation 4 Pro. That console is Sony’s 4K HDR box, and it’s not quite as powerful as the Xbox One X. They both handle HDR well, which means better graphics —in Assassin’s Creed Origins light reflects of water more naturally and seems to drift through the open weave of my cloak more realistically. But the PS4 Pro simply doesn’t appear to upscale content to 4K as nicely. You might not even notice unless you’re a nerd who likes to sit close to the screen and flip between the same scene in the original Destiny on both consoles over and over again, but yeah, there’s a little blur to the playback on the Playstation 4 Pro. The graphics just aren’t as crisp ones the Xbox One X. But again, neither the $400 Playstation 4 Pro nor the $500 Xbox One X plays back content as nicely as my PC with its $400 CPU and $500 video card. If you want the very best visual quality, then spending a grand or more on a PC will do the job. But people don’t buy consoles for the very best visual quality! They buy a console because they want a perfect blend of a price, quality, and ease of use. Consoles are cheaper and faster to set up, and, for most people, the visual quality of the games is good enough. And when you consider dynamic 4K resolution, and the power required to get as close to 4K as often as possible, then the Xbox One X is easily the best blend of price to quality you can find in a gaming console right now. Particularly as it isn’t just a console. Besides handling video games and most of the major streaming apps (including Netflix and Amazon Prime), the Xbox One X, like its cheaper sibling the Xbox One S, also plays ultra high-definition Blu-rays: Blu-rays that support 4K, HDR, and an ultrawide color gamut. Blu-rays might not be the coveted media format DVDs and VHS were, but when I play back Star Trek Beyond on a UHD Blu-ray the picture is far better than when I stream it via Amazon. I feel like I can make out every single star as the Enterprise zooms by, and, thanks to the wider color gamut even the Star Trek Beyond logo pops more on Blu-Ray. It’s kind of crazy how much better a UHD Blu-ray is than streaming. 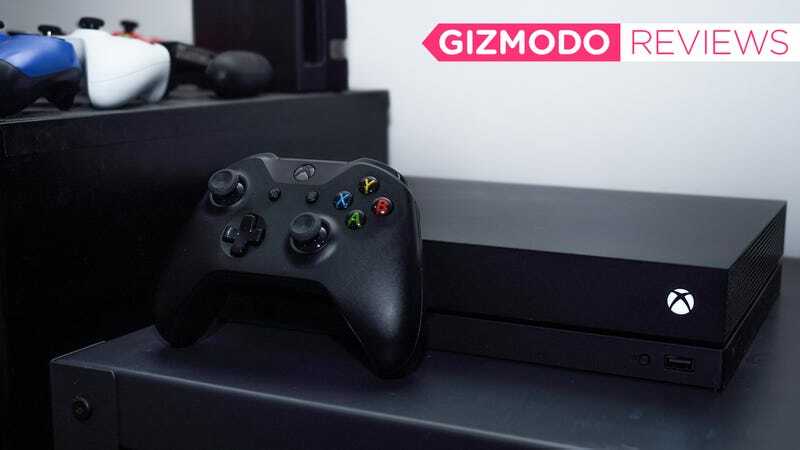 As with all other Xbox One consoles, there’s and HDMI In port for connecting to your cable box. But the Xbox One X isn’t just the fastest console with the best graphics, it’s also the most expensive console available right now. Hell, at $500 it’s twice the price of the $250 Xbox One S, which also supports UHD Blu-rays, 4K, and HDR. The big difference between the two is that the Xbox One X can upscale media to 4K and it can hit 4K more consistently on newer games. So should you actually buy this pinnacle of game console design? If you’re Xbox-obsessed and need the best quality playback, then yes, go buy it right now and marvel at how much prettier light reflects of water and blood splashes onto walls. If you’re dedicated to the Playstation, clearly, do not. You’ve made your choice already. The same can be said if all your friends have PS4s, and you’re planning on a lot of multiplayer Destiny or FIFA. The Xbox One X is very good, but you can’t play friends on the Playstation or PC, and, as we’ve noted before, there are twice as many Playstation 4 consoles out there than Xbox One consoles. So the pool of potential multiplayers is much larger. This system is really for the PC gamer that is willing to compromise (and doesn’t mind playing with a controller instead of a mouse and keyboard). The Xbox One X has the best console graphics available, in one of the smallest packages short of the Nintendo Switch. It can play nearly all the same games as a PC, and you usually only have to buy those games once for both systems. This is a dream-like halfstep for a PC gamer looking to wade into consoles or a console gamer pondering the expensive move to PCs. The Xbox One X will never be the most popular gaming console of this 8th generation, but it sure will produce some of the prettiest games. It’s smaller than the Xbox One S and the Playstation 4, which is very nice. The 4K upscaling is definitely superior to what you get on the Playstation 4 Pro, and it will even play back games sharper on a 1080p set than an older Xbox One or Xbox One S.
Unfortunately, it’s not as good for multiplayer as there are twice as many players on Playstations.